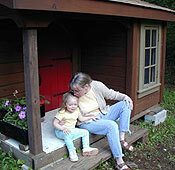 Are you having difficulties visiting with your grandchildren? Do you know your legal rights as a Grandparent? Dear Grandparent, You are NOT alone! Unfortunately, with the number of divorces escalating at a frightening rate, more and more grandparents just like you are experiencing fear and despondency regarding the fate of their beloved grandchildren. * You may have difficulty seeing them on a steady basis or you may have been denied visits altogether. * You may suspect, or even know, that they are neglected and possibly abused; maybe even left alone for long periods of time without loving supervision or protection. * You may fear that they are being unduly disciplined by some “stranger” who has moved in with the child’s parent. * You have heard “inklings” from neighbors, or relatives, or the child, about drugs and parties, and many “friends” coming and going. * You may have found that they are being "warehoused" in daycare. * You may realize that they have been "given" to the other Grandparents. "It’s especially hard around a holiday or their birthday, when I know I won’t even be able to talk to them on the phone…"
Our nationally-known experts have developed two bestselling books, with the goal of arming you with all of the up-to-date information regarding your legal rights, as well as to guide you, step by step, through the process of exercising those rights. and guidance available on this subject. With the number of divorces escalating at a frightening rate, more grandparents are experiencing serious problems involving their grandchildren. ~ You may have difficulty seeing them on a steady basis or you may have been denied visits altogether. ~ You may suspect or even know that they are neglected and possibly abused. ~ You may have found that they are being "warehoused" in daycare. 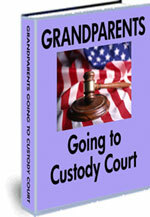 ~ It is not uncommon for grandchildren to have been "given" to the other Grandparents and maybe necessary to go to court to help their grandchildren. 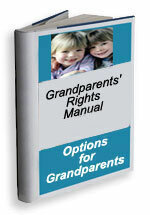 This report is designed to let grandparents know their legal rights. This 129 page report presents the most current information available. 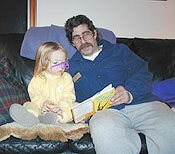 It will show you clearly WHAT YOUR OPTIONS ARE IN HELPING YOUR GRANDCHILDREN. information for the specific state that you select. This publication totals 204 pages-broken into 10 chapters (each chapter can be downloaded and printed separately). This is an entirely unique publication. It contains information from Dr. Barry Bricklin and Dr. Gail Elliot, two nationally-known and respected Child Custody Experts, who have been given access to those private "inner circle" areas of the judicial process that ultimately decides the fate of your Grandchildren. Are you going to file for VISITATION or CUSTODY? When can I go to court to ask for formal visitation rights? If my grandchild is placed for adoption, will I lose my visitation? From Dr. Bricklin and Dr. Elliot: "One of the things we want to cover is what is called in the scientific community the role of "bias." Biases are behaviors (here, we speak of those we observed in the psycholegal world) that can work against you, even though the so-called negative item does not really predict bad or poor parenting skills. A bias is much like a prejudice. We call a criticism "prejudiced" if we feel that a person is being faulted for something that does not really point to any true negative. We have observed the prejudices covered here among judges who are otherwise fairly intelligent and well meaning. THE CUSTODY EVALUATION MAY BE A CRITICAL ELEMENT IN THE DECISION- MAKING PROCESS OF YOUR CHILD CUSTODY CASE. IT WOULD NOT BE UNUSUAL FOR THE JUDGE HANDLING YOUR CASE TO ORDER A CUSTODY EVALUATION BE SUBMITTED TO THE COURT. WHAT CAN YOU EXPECT? WHAT DO EVALUATORS LOOK FOR DURING A COMPREHENSIVE CUSTODY EVALUATION? CAN YOU PREPARE FOR A CUSTODY EVALUATION? Many times this report is a critical element of your case. There are many items to think about and consider as you prepare to get involved, or re-involved, in any custody dispute. This list will help you better organize these items. It has been prepared using all of the training and experience of our 35 years in the field as Custody Evaluators, Expert Witnesses, Authors, and Consultants in Custody Cases all over the United States. If you energetically follow the Checklist , dig out all of the necessary answers and write them down, and communicate that information to your lawyer, witnesses, etc., you will significantly help your case! "What good is it to have court-ordered custody and visitation rights if they are always being interfered with?" There are legal processes available in all 50 states that will help DEFEND your custody and visitation rights! 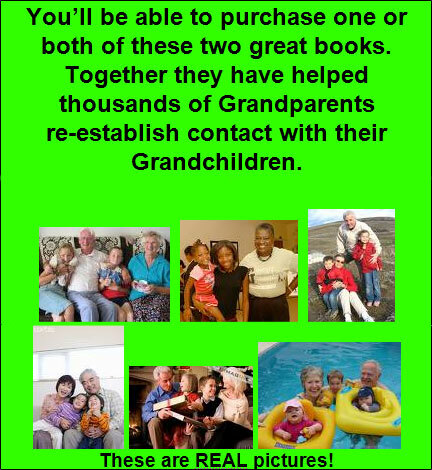 These books have helped thousands of Grandparents help their Grandkids. All you have to do is CLICK on a title, wait about 20 seconds, and that publication will open for reading and printing. You’ll be able to return to the Download Site over and over, 24 hours a day, 365 days a year. Why a Download and not a regular book? Because everything in the field of Grandparents’ Rights is moving too fast—way too fast to take the 18 months to produce a book and find that EVERYTHING is outdated. With a Downloadable Publication we can make changes IMMEDIATELY (and we do) ---you are always getting the most recent information available! This is convenience at its best from the privacy of your own computer! There is nothing like getting the vital answers you need instantly no matter what time of the day. "Nothing has been changed in note below." I had to write and say THANKS for the help!!!! Your book really did the trick. I love you guys! In response to requests from Grandparents from Coast to Coast our staff has developed a Grandparents’ Rights Legal Forms Kit. The Kit not only provides the Legal Forms necessary to file for Visitation but “takes you by the hand” and shows you how to fill out the forms, file the forms at your local court, represent yourself in court, serve the papers on the other party, and even how to testify in family court. Over 200 pages---VERY, VERY COMPLETE! THIS KIT COMES AS A FREE BONUS WHEN YOU PURCHASE ANY OF THE THREE GRANDPARENTS PACKAGES BELOW! PLUS, TO HELP YOU SAVE MONEY ALONG THE WAY TO HELPING YOUR GRANDCHILDREN, WE’RE INCLUDING THIS WONDERFUL PUBLICATION THAT HAS SAVED 1000’S OF MOMS, DADS, AND GRANDPARENTS A HUGE AMOUNT OF MONEY OVER THE YEARS! This Publication contains over 900 pages and thousands and thousands of specific resources that will help you assert your Child Custody Rights while spending little or no money! Every state is represented! You’ll be able to come back to this site whenever you need to research economical ways to handle your case. It will be open to you for one full year!